Martha Choe began her Life Achievement Award acceptance speech with Eleanor Roosevelt’s quote at the Seattle Business magazine’s Executive Excellence Awards dinner recently. At the Fairmount Olympic Hotel, most people in the room were aware that Choe, chief administrative office for the Bill and Melinda Gates Foundation (BMGF), works with smart, remarkable, and influential leaders, including Bill Gates Jr. and Sr., Jeff Raikes, Patty Stonesipher, Sylvia Mathews Burwell (all three were BMGF executives), and U.S. Ambassador to China Gary Locke. Choe called them mentors, role models, and teachers. What was not mentioned during the program was that Choe is actually a community mentor. She has mentored an impressive list of successful leaders in her career. Seattle Mayor Ed Murray is one of them. Murray once worked for Choe as an aide when she was a Seattle City Council member. He publicly thanked her as his mentor the night he was elected mayor of Seattle last November. The other aides are now stars in their own organizations. 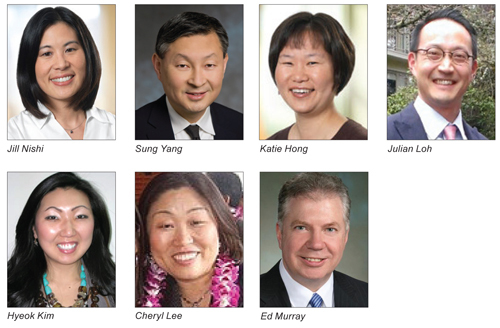 Jill Nishi is the senior adviser to U.S. programs for BMGF; Sung Yang, King County Executive Dow Constantine’s chief of staff; Cliff Traisman, owner of his own lobbying firm; and Choe’s intern, Julian Loh, district director for Congresswoman Suzan DelBene. Other people Choe has mentored include current Deputy Mayor Hyeok Kim (whom Choe, along with several others, recommended for the job), former Shoreline City Council member Cheryl Lee, Katie Hong, and more. A former Big Sister herself mentoring young women, Choe is currently one of the most popular community mentors for upcoming leaders, and for valid reasons. Just examine her resume — you will quickly realize Choe’s interesting experiences, diverse roles, and successful career track record make her a truly a transformative leader. From a high school English teacher to a banker, Choe ran for office in 1990 and won a seat on the Seattle City Council. She was the first Korean American official elected in the entire country. During her two terms as council member, The Seattle Times rated her as one of the brightest and most hard-working council members. Choe was poised to run for mayor, but pulled out due to personal reasons. I remember how disappointed the Asian community was. Then, Gov. Locke appointed her to head the Washington State Department of Community, Trade, and Economic Development, a critical time as Boeing wanted to shop for out-of-state bids to build planes. Choe and other business leaders fought hard to keep Boeing’s future orders in our state. Finally, Boeing chose the state’s bid. With BMGF, Choe deals with global problems, such as agriculture, poverty, diseases, family planning, and even libraries. Such a rich and resourceful background is beneficial when people seek out advice. I can name many great Asian American leaders, but very few great Asian American mentors who have cultivated such an extraordinary group of individuals as Choe has. Her tireless support of the Asian community illustrates her drive to empower future Asian American leaders. That’s a significant legacy that we should applaud, and for which we should be grateful to Choe. What is required from mentees, Choe said, is that they be reflective and have a bold desire to learn and improve. They want their mentors to be honest. Mentors offer them insights, asking them questions. As a BMGF executive, Choe receives regular feedback anonymously from as many as 30 people, including her peers, managers, and boss. They tell her what should change, what’s wrong, and even what works and what doesn’t work at meetings. BMGF calls it the 360-degree all-round feedback system. Feedback should be given often, not something someone did the year before. Leaders as well as mentees should receive feedback to make sure that it matches with reality, Choe said. Without putting down names, people feel safe to express honestly. That’s how Choe empowers her mentees — by setting an example.